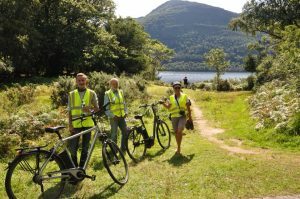 Cycling in Killarney National Park is always delightful. With its endless off-road paths offering magnificent views around every corner, you could travel a new journey every day for weeks. 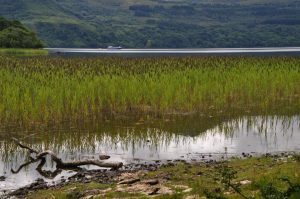 In the past, we have cycled from Killarney, over the Gap of Dunloe and back around past Lord Brandon’s Lodge and home by the Upper Lake, Torc Waterfall and Muckross. However, as we had German visitors this time who were using electric bikes for the first time, we chose an easier (but really lovely) route. We parked at Ross Castle and cycled out to Muckross. 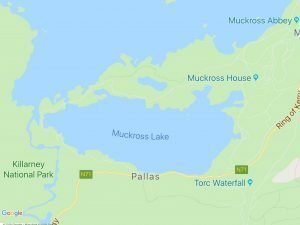 There are cycle paths now almost all the way out of Killarney town towards Muckross. Once into the network at Muckross, we took the path around Muckross Lake towards Dinis Cottage. Every twist and turn on this hilly path offers breathtaking views, so unless you are very self-disciplined, you will keep wanting to stop to take photographs! Dinis Cottage itself is a great stop. Now a tearoom which is open during the main tourist season, it has a history dating back to the 1700’s. Used as a hunting lodge in the 1800’s, names and dates of lovers were carved into the windows, supposedly with expensive diamonds from their rings! The famous Meeting of the Waters can be seen around the back of the cottage. 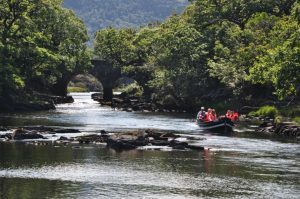 The path continues past Dinis and brings you back onto the N71 for a short while and you can stop at the impressive Torc Waterfall. 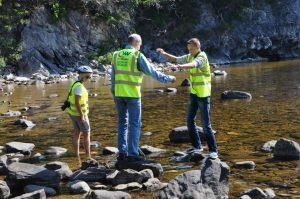 Then you can re-enter the Muckross path network and cycle all the way back to Killarney, off-road. 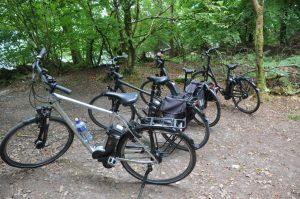 As we had parked at Ross Castle, and the visitors couldn’t get enough of their electric bikes, we then cycled into the woods at the castle. The furthest point had to be found, so we cycled out to Library Point. In springtime, this would feature a carpet of bluebells and also wild garlic. In autumn, this deciduous wood is spectacular in its colour. This time of year, it was just a tranquil trip through green leafy canopies, and sure what is wrong with that?